By decoding the Joseph Joseph brand into the attributes of: using functional, playful, simple, and empathically-driven design, I designed a radio responding to these features. This piece of technology to adds to the kitchen experience by combining research-driven insights with the visuals of the brand. This project focused on understanding a brand's language and unique selling points in order to design a product that matched their style, feel, and existing product line. I completed this work at Central Saint Martins, in London, UK. While the exterior design is styled complimentary to Joseph Joseph's existing product lines, the functionality responds to the pain-points of interacting with technology in the kitchen by allowing the product to operate in multiple orientations and utilize wall space. Conducting empathic studies created a design process which mimics how Joseph Joseph innovates upon and designs their products. Attending a seminar with Tony Joseph, the co-founder of the brand, allowed me key insight into the company's methodology, including the roll these empathic studies plan in their design process. 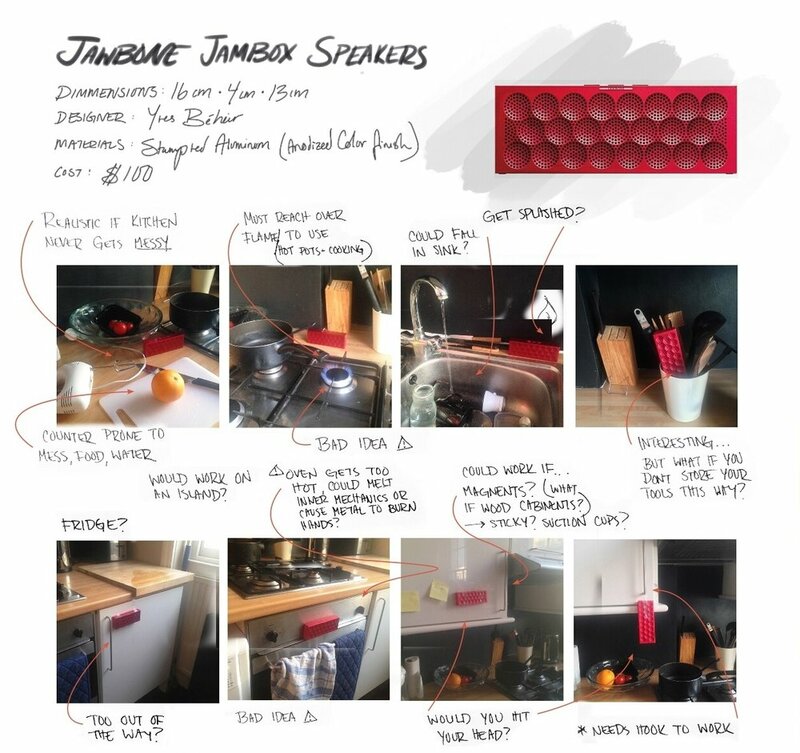 I used a speaker throughout the kitchen to understand the overall experience and challenges when using technology while cooking. Valued Space. There was no permanent counter-space that appropriately housed the speaker. Places on the counter were too close to liquids, foods, and the overall mess of cooking, while nearby shelves/bookcases were too far away. Undervalued Space. I found that, for my particular situation, taping the speaker to my cabinets allowed me to maximize my cooking space while still keeping the speaker central. Physical Interactions. At many points cooking, I wanted to change the song/station but could not due to wet or dirty hands. Knowing that I wanted to crate something compact and simple, I studied the Lexon Tykho Radio to understand how this competing product executes its design. Material. The radio's material responds to its usage; it has a silicone shell for the dual purpose of adding a textured grip and ensuring the device is waterproof. Simplicity. The device eliminates all features that are not absolutely critical (displays, instructions, text, dials, numbers). It's minimal interactions are well executed and satisfying. Practicality. The form and minimal functions of this radio make it extremely practical for travel, small spaces, and quick usage. Understanding Joseph Joseph's position on sustainability as well as the overall environmental considerations for building a radio allowed me to create a design authentic to the brand both inside and out. Joseph Joseph's products aim to encourage users towards a more environmentally friendly and eco-conscious lifestyle. However, the brand does not use sustainable practices or materials. Even though a focus on environmental sustainability was not paramount to the brand, I considered other forms of sustainability and expanded the definition to include social interactions and economics. A futuristic radio that uses voice commands and sensed- gestures to control interactions in order to eliminate the pain-points of using a device while cooking. Cylindrical shape affords multi-orientation usage without the devicerolling or moving accidentally. A multi-orientation radio with simple buttons and interactions that innovates upon a classic design. Following the classic archetype of the radio, this design uses simple buttons to control interactions while adding the ability to mount this device to any flat surface. This design ensures that the radio can still be fully present in the kitchen, without taking up counter space or being in jeopardy of spills or messes. The design evolved to incorporate a more simple profile and respond to the insights found while experimenting with low fidelity prototypes.